Noelle Saenz is Jeanie Price's daughter. Her Web site reveals a vibrant young woman living on Maui and enjoying life to the fullest. Suzanne Vega is the daughter of Patricia Schumacher (Vega). Her interesting WEB site covers her career as a pop-folk singer and songwriter. Patricia's son Tim Vega (who recently passed away). Has a excellent display of his art work on his WEB site. Chris Bilheimer is Penny Barne's (Bilheimer) son. Find out all about what he's doing for R.E.M. Larry Keels and his family pose for a portrait. They all live in Texas. Lani Steele and her family on vacation in the Vietnam in 1996. She lives in Manila, Philippines. 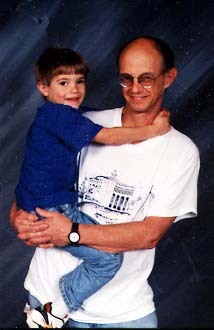 A recent photo of Joe Sturges and his son Sean They make their home in Ashland, Oregon. Briney Harris, surely the youngest progeny in the whole Vagabond camp, herself a life-long Democrat (three months running), here caught in a rare interview with a top Republican (in his mind) stalwart. Christa Harris served as a translator. Joanna Rossman (Morgan) Joanna and her family pose for a picture at her daughter's wedding. 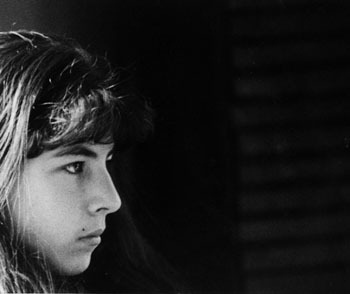 Phoebe Seligman A striking picture of John Seligman's youngest daughter at age 15. She is now almost 18. Scott, Laura, and Jim Bandler Here you'll find out about the Bandler family. The Naegele Clan Click here to find out all about Tim, his two kids, his in-laws, some cousins and his "live in love from Ireland (and future wife)." Some of our kids have their own Web Pages. Maya Seligman This articulate and creative 19 year-old's web page is an exciting and colorful exploration into all aspects of her life and imagination. Timothy Grimes is the son of Cherie Evans (Manhattan class, Winter, '58). Find out here what Tim is up to. Josh Brolin the son of Jim (Bruderlin) is making it in Hollywood and beyond.